Need to update your wardrobe? Forever 21 has you covered with the buy two get one on selected items. 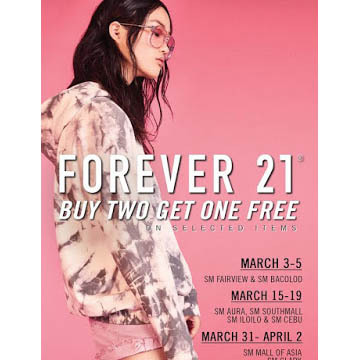 Promo runs from March 15 to 19 in Forever 21 branches SM Aura, SM Southmall, SM Iloilo, and SM Cebu.